Update: This joint has recovered from their fire and are now open for business. Being able to see your meat being chopped, sliced, and portioned can really improve your meal if you know what to ask for. After ordering up a three-meat combo of ribs, sausage, and sliced brisket at Hutchins, I noticed the knife man grabbing for a dried-out hunk of lean brisket from the flat. 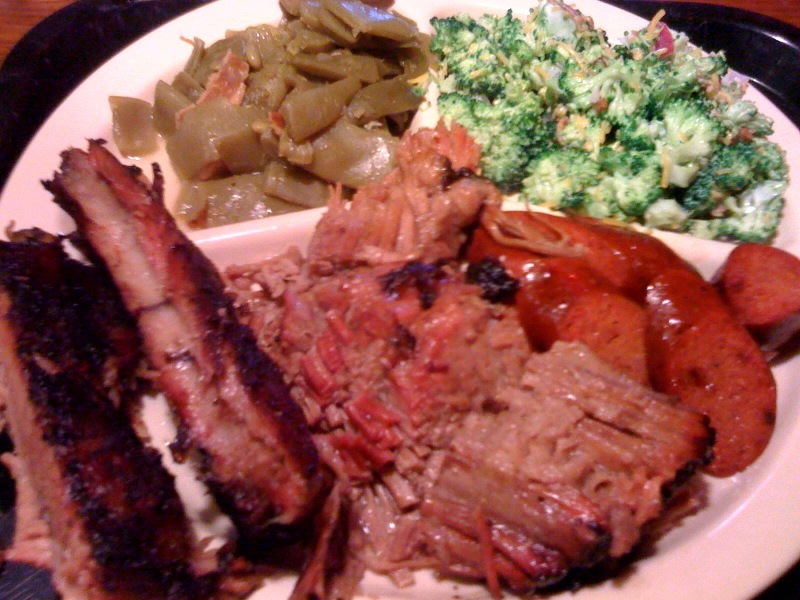 I kindly asked for some fatty brisket instead that is normally reserved for portions of chopped beef. The resulting fatty brisket had a silky texture with perfectly rendered fat throughout the cut. The meat was more chunked than sliced because it had already begun to fall apart. Heavily seasoned with salt, the bites with some of the well-formed crust packed a powerful flavor punch, but I could have used a good dose of smoke that was missing. Ribs were on the verge of being overcooked, but were definitely not mushy. Again, they were well seasoned and needed a bit more smoke, but the texture was luxuriously moist with plenty of good melty fat running through. The sausage was average with a little kick, but had good moisture without being overly fatty. A side of sweet broccoli salad was a nice change of pace from the BBQ standards, and the green beans had great pork flavor from the bits of bacon mixed in. Skip the free desserts which they couldn’t with good conscience charge any amount for. Otherwise, be sure to pay attention when ordering. Why bother with the dry stuff they want to serve you when the good moist meat is right next to it? Doesn’t Randy White have a stake in Hutchins? Tried the Q today, this place won’t get any recommeations by me. Ribs were overlcooked as was the hot links and brisket. Not much smOke flavor in the meat. If you can eat $14 worth of Bananna Pudding, and tea…THIS PLACE IS FOR YOU! As of right now, this places is closed due to a fire. They are reopening the week of Nov. 5. Hutchins has really got this place going. Been there 7 times in past 5 months and have not been diissapointed once. If I don’t eat there I buy Family pack and take to my Customers, they all love it! Tim has done a wonderful job since reopening! Very good BBQ!